In the Crossover Domain section, you see the object the values will be copied from, also called the Source Object. Actually, this is the same as on a table domain. This source object will be the source of the values for the values list. 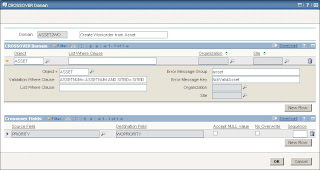 In this example, the value list will show a list of assets. If you do not want to show all records from the source object in the value list, you can provide a where clause in the field List Where Clause to filter records. The field Validation Where Clause is used to specify a where clause that is used against the source object when validating a value that is entered in the originating field. 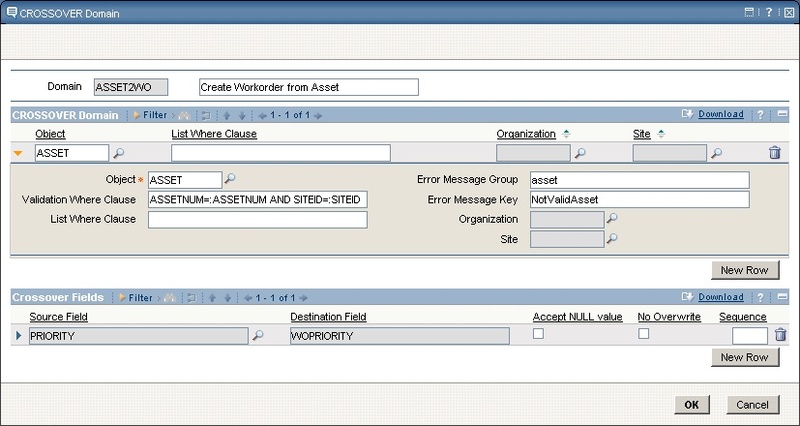 In this example, when you enter a value in the work order asset field, this value will be validated against the Asset object using the validation where clause specified on the domain. In the Crossover Fields section, you will see the source field, PRIORITY (from the Asset object), and the destination field, WOPRIORITY (from the Workorder object). You can add additional fields here. For a crossover domain to work, it has to be linked to the field that has to trigger the crossover action. If you want to copy values from the asset to the work order, you link the crossover domain to the Assetnum attribute on the Workorder object. You will most likely do this in Database Configuration. However, Maximo out-of-the-box crossover domains are often linked to an attribute through a java class, specified on the attribute. ASSET2WO is an example of that. You can add additional fields to these crossover domains to suite your own configuration.